The LASP-led Mars Atmosphere and Volatile Evolution (MAVEN) spacecraft has arrived in Florida to begin final preparations for launch this November. The spacecraft was shipped from Lockheed Martin Space Systems in Littleton, Colo., to the Payload Hazardous Servicing Facility at NASA’s Kennedy Space Center on Friday. The solar-powered MAVEN spacecraft will begin orbiting Mars in September 2014 in a first-of-its-kind mission devoted to understanding the evolution of the Martian atmosphere. The principal investigator for MAVEN is Bruce Jakosky, Associate Director for Science at LASP and Professor of Geology at the University of Colorado Boulder. MAVEN will be removed from its shipping container this week, the first of the remaining milestones to prepare it for launch. The spacecraft will then begin functional testing to verify its state of health after the trip from Colorado. After this, the team will load updated flight software and perform a series of mission readiness tests. These tests involve the entire spacecraft flight system, as well as the associated science instruments and the ground data system. 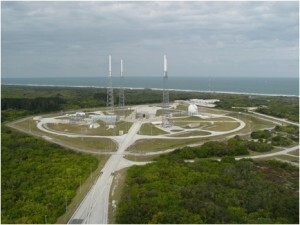 MAVEN will be lifted into space aboard a United Launch Alliance Atlas V rocket from Launch Complex 41 at the Cape Canaveral Air Force Station in Florida. The launch period opens Nov. 18, 2013, and extends through Dec. 7. For a Nov. 18 liftoff, the launch window opens at 1:28 p.m. EST.